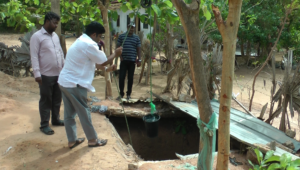 In 2017 the North East of Sri Lanka suffered its worst drought in 40 years – and over 1200 families from 40 churches were in desperate need of drinking water and food. The emergency will probably last until at least February when the next rice harvest is due. See below for our video and a fuller report. The country has experienced increasingly extreme weather in the last decade. The north and east have had little rain in the past 18 months and are suffering their worst drought in 40 years. Nearly all our churches in these regions are affected and without help, we fear many people will die. Nearly all of the last rice harvest has been lost, the vast majority of crops and home garden produce had died and the wells have been drying up. Some people already faced journeys of miles to the nearest drinking water supplies. Most of our churches are in Tamil areas where the 25-year civil war was fought and the tsunami struck. The war ended in 2009 but it left a legacy of poverty and lack of businesses, electricity or running water and a generation with minimal education. The majority of people live off the land, and without help, when the land dies…they die. Traditionally, families borrow to plant crops and then pay back at harvest time. With a succession of poor rice harvests, many are now in debt. They initially sell all they own, then if possible one parent, normally the father, will try to find a job in the cities. Alternatively, some go abroad; the women to work as home helps, but are often cheated by agents or abused by their employers. Widows with children have little choice but to stay and eke out a living mainly in seasonal agricultural work. As with the land, these jobs have dried up. Over the years, many people have just got by in the dry season, but this is different. It is uncharted territory with no-one quite sure what will happen. The seasonal rains are not due for 3 months and, with the average day summer temperature in the mid 30s, water is disappearing fast. The remaining well water is often dirty and some are becoming sick drinking it. Others have so little to eat they are developing stomach ulcers. We have started sending out water bowsers (tankers) to the villages. We are increasing the food we give, initially to the most needy, but food costs are rising. We are looking to dig existing wells deeper and to build new, deeper, tube wells in each church village. Longer term, we need to help the people develop their own small businesses. We also want to buy more land near churches where there is a better underground water supply and to employ our church believers to cultivate it. We have already brought a number of acres and are developing sites. However, the needs can feel overwhelming and far exceed our resources. We have asked the LEFC churches to tell us their needs and more than 1200 families across 40 churches need our immediate support. Numbers could rise over the next few months if the rains do not come. Many thanks for your kindness and support.